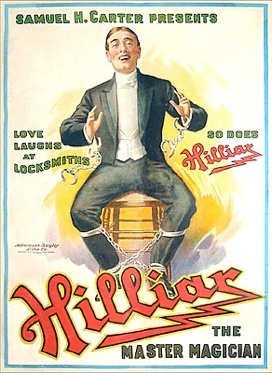 William J. Hilliar was a magician and author who edited Billboard's "Magic and Magicians" page for many years. He was also close friends with Houdini. "That friendship will always stand out as one of the dominating factors in my life," said Hilliar. 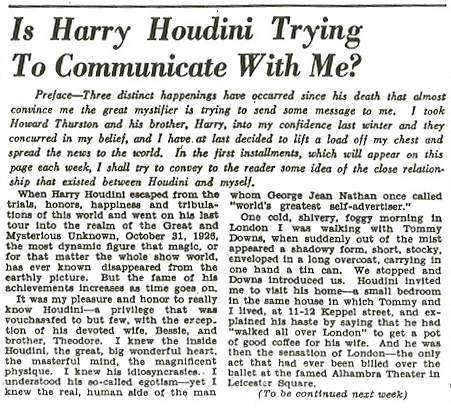 In 1933 Hilliar penned a multi-part series of articles for Billboard titled, "Is Harry Houdini Trying To Communicate With Me?" Hilliar's story of fading photos and strange photographic blurs is mildly interesting (Kalush relates part of it in Secret Life, pages 532-533), but what I found much more captivating were his personal recollections of Houdini himself. These are wonderful slice of life moments that offer us a candid glimpse of what Hilliar calls "the human side of Houdini." William John Hilliar was born in Oxford, England in 1876. Inspired at age 14 by seeing Bosco, he became a professional magician and magic author. He ghost-wrote Modern Coin Manipulation for T. Nelson Downs and Howard Thurston's Card Tricks. In 1902 he moved to the U.S. where he founded The Sphinx magazine and published Modern Magician's Hand Book. Hilliar was said to be so skilled that he once substituted on stage for Thurston with no one in the audience realizing the switch. One cold, shivery, foggy morning in London I was walking with Tommy Downs, when suddenly out of the mist appeared a shadowy form, short, stocky, enveloped in a long overcoat, carrying in one had a tin can. We stopped and Downs introduced us. Houdini invited me to his home--a small bedroom in the same house in which Tommy and I lived, at 11-12 Keppel street, and explained his haste by saying that he had "walked all over London" to get a pot of good coffee for his wife. One day he said: "So many imitators are springing up that when I leave the Alhambra to play the biggest houses in Continental Europe some think they are going to reap a rich harvest on the name I have created, but I am going to play poker and fool them. I have a brother in America, Theodore Weiss, and I have cabled for him to come over. I am letting into the secret." Theodore came, and as Houdini prepared to leave for Paris, announcements appeared in the London papers that the "real" American handcuff king -- Hardeen -- was on the way to show Houdini up! His mother had died in the meanwhile and he often talked of her to me. Over at his Brooklyn home I have sat and talked with him while he was lying on an old faded and bedraggled sofa which, with tear-dimmed eyes he told me was his mother's and that he could almost feel her presence. We often discussed spiritualism and what it would mean to him if he could get a message from his departed loved one. He suddenly stopped, apparently glued to the floor, and shouted as he pointed at the door, "Hilliar, where did you get that lock?" I told him it was there when I rented the place and that, although it was of unusual shape, I had paid no attention to it. He gave me one look of mingled scorn and distrust and said: "There are only two locks like that in the world. I have the other one and I'm going to get this." And he did. He went to the janitor, bought the lock and took it home. At intervals, after this incident, he would question me regarding the lock, eventually confiding to me that these were the only locks he had ever see that he could not open without special keys. "It's not egotism, Hilliar, it's Houdini-ism. I implicitly believe in myself and as all I have to sell is myself I am going to protect my name at all hazards and will fight to the last ditch to keep the name of Houdini a household word. If the world believes me to be the greatest magician of all times, well, I believe it too. Always believe in yourself and trample underfoot parasites who may try to undermine your foundations, and you will win out provided you are on the level. I may have played the part of an egotist at times, but I was merely assuming the character for reasons." "So in Harry Day's Rolls-Royce I went to Ilford and knocked at the door. A lady came and opened it. 'Is Mrs. Hilliar home?' I asked. 'Yes.' 'Is Mrs. Hilliar home?' 'Yes, I'm Mrs. Hilliar.' 'Well,' said I, 'here I am after traveling just about 15,000 miles and I bring you a message from your son William, and, he told me to give you a kiss for him.' Your dad came upon the scene just as I put my arms around you dear old mother and kissed her for you. She had tears of joy in her eyes, saying happily, 'How just like him to do such a thing.'" "Be sure to write them as often as possible. Your mother said: 'He does not write as often as I'd like,' so sit down and write her a long, loving letter, for, Bill, some day that will be impossible, and like my own sainted God-fearing sweet mother she will be unable read letters from you. So sit right down and tell your mother how much you love and worship her and it will help her beguile the long hours away until she can again enfold you in her honest-to-God loving embrace." Hilliar states that he "could write indefinitely of the human side of Houdini--the Houdini that the world and very few magicians ever knew." In his Billboard series he also shared the last words Houdini ever spoke to him. Apart from advising Hilliar to stop drinking highballs -- "They'll get you in a year or so" -- Houdini made a remarkable prediction of his own longevity. But I'm going to save that quote for another post. Tragically, William J. Hilliar committed suicide on November 15, 1936 just before his 60th birthday. Thanks to researcher extraordinaire Diego Domingo for finding this remarkable series that ran in Billboard from October 28, 1933 to January 27, 1934. Also thanks to the always awesome Lisa Cousins for alerting me to these and making copies. Hilliar background from Magicpedia. LOL, thats funny you should say that. When I read your blog and it said Hilliar committed suicide, I thought..."this needs more exploring". Yeah, I almost posted on the Genii forums asking if anyone had any info on why he committed suicide (shot himself, btw). I'd like to know more. It's also interesting that that poster shows him as an escape artist. That "love laughs at locksmiths" is also a line Houdini used. Who used it first, I wonder? WOW. Amazing stuff to read. I'm saddened that Hilliar killed himself in the end, poor man. Glad to hear his recollection of the 'human' Houdini. Seems like the more we know about Houdini, the less true the old 'egotistical megalomaniac' image of him appears to be. Perhaps that's Houdini's best trick ever--being SO 'Houdini' as to be nearly inscrutable except to a close, trusted few. It's interesting to see that he had an awareness of his ego. But I find it ridiculous when someone criticizes Houdini for "having an ego". Who in showbusiness doesn't have an ego? You some regards have to be a "supreme egotist" to make it. You know what struck me is that Houdini was aware of his egotism and I always had a hunch about that. You are right about showbusiness people having an ego. And often it's nothing more than trumped up for publicity purposes. Thanks David. I love this kind of stuff. These little moments can really paint a picture of what Houdini was really like.